By Leah Dobrinska. Dec 12, 2015. 9:00 AM. Collecting Nobel Prize in Literature winners makes sense: there’s a list to follow; a new author is chosen each year from all around the globe, allowing for an eclectic reach; and your collection will be filled with the best of the best. Today, we continue our efforts to spotlight Nobel laureates, and picking up where we left off last time, we’d like to feature two more German winners. Read on for tips and tricks for collecting the works of Thomas Mann and Herta Müller. 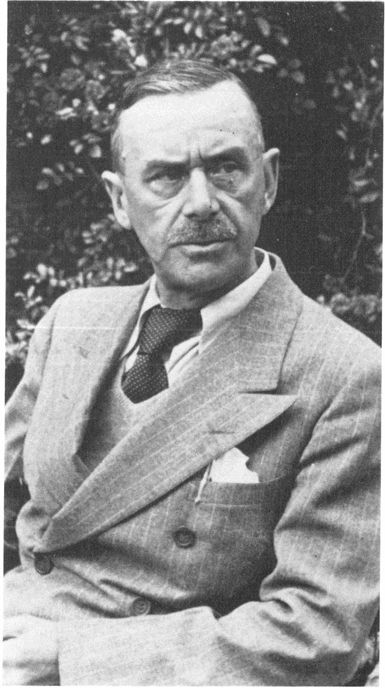 Thomas Mann won the Nobel Prize in Literature in 1929 “principally for his great novel, Buddenbrooks, which has won steadily increased recognition as one of the classic works of contemporary literature”. It makes sense for us to begin a discussion of collecting the works of Mann, then, with Buddenbrooks. Buddenbrooks was Mann’s first novel, published in 1901 in Berlin by S. Fischer. It is largely based on his own family and life in his hometown of Lübeck. Initially, sales of the book were slow, but now it’s considered Mann’s most widely republished work. 1901 first editions were printed in two volumes with gilt lettering of the title and author’s name on each cover and spine. The title and author’s name are surrounded with a black-colored boarder on the cover and a similar black embossed print is seen on the spine. These first edition copies will cost a collector upwards of $10,000. The first American edition of Buddenbrooks was published in black cloth in 1924 by Alfred A. Knopf in New York. It was translated from the original German by H. T. Lowe. Likewise, the first U.K. edition was published in 1924 by Martin Secker in London. This edition also featured the H. T. Lowe translation, and originals have green cloth with gilt lettering on the spine and front boards. U.S. and U.K. first editions cost significantly less than first German editions, and they will run a collector anywhere from a couple hundred to a couple thousand dollars. A signed edition is a great addition to one’s collection. Moving on from Buddenbrooks, Thomas Mann collectors have numerous options. As with any authors-based collection, we highly recommend beginning with a trust-worthy, comprehensive bibliography. 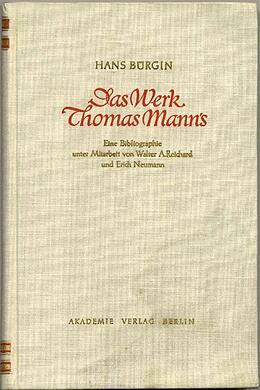 In the case of Thomas Mann, if it is original German works you’re looking for, we’d recommend looking into Das Werk Thomas Mann’s by Hans Bürgin. To highlight a couple of the more notable Mann titles you’ll see in Das Werk, we’d draw your attention to Der Erwahlte which translates to The Holy Sinner. In the book, Mann takes up the medieval legend of Pope Gregory. Der Erwahlte was first published in Germany in 1951 by S. Fischer Verlag. Only 60 copies were published, and they were issued in order to secure an American copyright. Acquiring one of the original 60 — numbered and signed — copies is supremely valuable; doing so will cost a collector around $5,000. The subsequent first American edition was also published in 1951 by Alfred A.Knopf. It originally had black cloth with gilt lettering on the spine. The first British edition was published in London by Secker & Warburg in 1952. Copies of the first British and American editions can be found with the author’s signature, and such books will run the collector anywhere from $300 - $800. Another great Mann collectible is Der Zauberberg which translates to The Magic Mountain. Limited first edition copies of Der Zauberberg, of which only 150 exist, float in and out of the marketplace, and obtaining one will cost a collector in the ball park of $10,000, depending on the quality of the book. These copies are numbered and signed. The limited first edition was printed in two volumes in 1924 by S. Fischer Verlag. You’ll find volumes with black calf binding and gilt lettering of the title and author on the spine. Der Zauberberg was not translated to English until 1927. First American editions were published in two volumes in 1927 by Alfred A. Knopf in New York. 200 copies were printed and signed by the author. One of these copies can cost over $2,000. First U.K. editions were published in London by Secker in 1927. 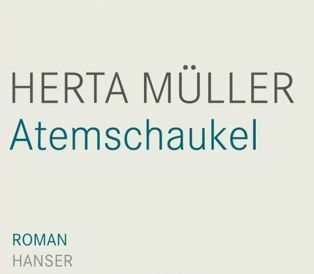 Herta Müller, “who, with the concentration of poetry and the frankness of prose, depicts the landscape of the dispossessed,” is a more recent Nobel laureate, winning the prize in 2009. As a result, many of Müller’s works are available for less of a premium. Much of her work deals with the repressed in her native Romania. Atemschaukel, which translates to The Hunger Angel is one such example. Atemschaukel is a long poem written in prose. It was published by Carl Hanser Verlag in Munich in 2009. It was translated by Philip Boehm in 2012 and published in the U.S. by Metropolitan Books as The Hunger Angel. Signed copies of the original Atemschaukel are available and will cost around $200. Likewise, only a small number of the hardcover original American edition were printed. Look for a signed copy with an in-tact dust jacket. The dust jacket will have a circle emblem with the words “Winner of the Nobel Prize.” These copies will also sell for around $200. Another necessary addition to a collection of Herta Müller’s works is her novel Herztier. Herztier or The Land of Green Plums was published in Germany by Rowohlt in 1994; the original volume has grey cloth. The first U.S. edition was published in 1996 in New York by Metropolitan Books / Henry Holt. The original text was translated by Michael Hofmann. First American edition copies of The Land of Green Plums are available for under $500. Many copies can be found to include an author’s signature. Collectors who are interested in association and/or proof copies are also in luck, as these will come in and out of the marketplace. True first American edition copies have a hardcover with a dust jacket that has an image by the Czech photographer Jan Saudek. In all cases, look for copies without a remainder mark. As Herta Müller is a contemporary author, collectors should keep in mind ephemera as interesting additions to their book collections. Photos of Müller, pamphlets from book signings or speaking engagements, etc. all make for excellent add-ons to one’s collection.